Who knows how use this options for Sparkfun Andruino Mega? There is no info in help and documentation. The documentation does not include these as we've not completed testing on this. The idea is that with encoders the Arduino module will change the output on the selected servos in order to compenstate for power changes (i.e. if you are going up a hill you need to increase power to stay at the same speed). The concept is that you specify the PID values (proportional is the easiest to start with) and select which servos you have your motors connected to. Then when you send a value to that servo the module will then change that value slightly based on the encoder values and the PID coefficients in order to maintain speed. Again, this has not been sufficiently tested but hopefully you get the idea. 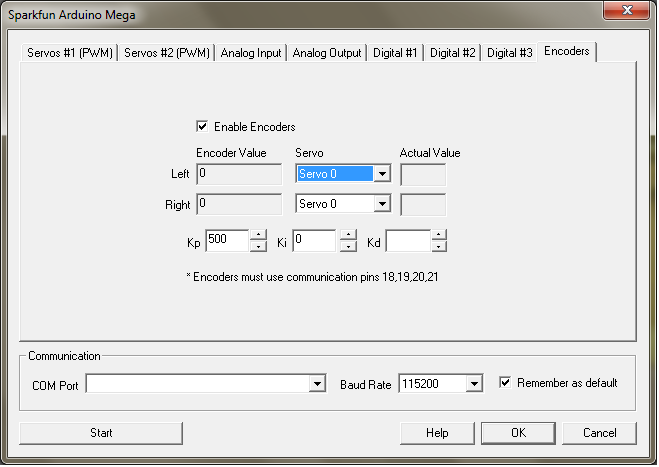 Note that with some high resolution encoders the Mega may not be able to keep up with the actual rate so watch your speed. This option is not available on the Arduino UNO/DUE/etc since they run at 1/2 the speed of the Mega and would not be able to keep up with high res encoders. Yes it makes sense, I used to try program the robot with the encoder (Low resolution, However the arduiono still cant really able to accurately measure the number of rotation accurately. Do you have any recommendations for encoders models? Which one has the best resolution and can be used with Andruino? I want to retrieve information about conveyor position. The robotic delta manipulator hangs over moving area. which runs at 80mhz which is much faster than stock Arduino.